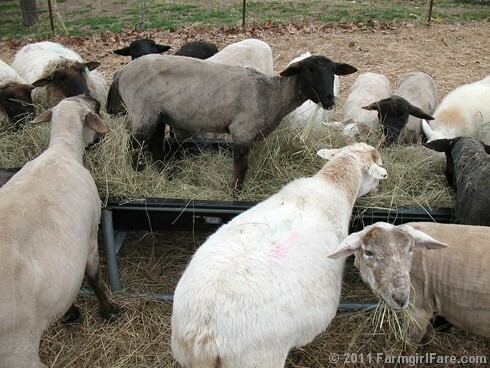 When I moved in with my hunky farmguy Joe 11 years ago, I brought 14 sheep (and a bunch of other critters) with me from my old farm. Martha, who died today, was the last surviving ewe. 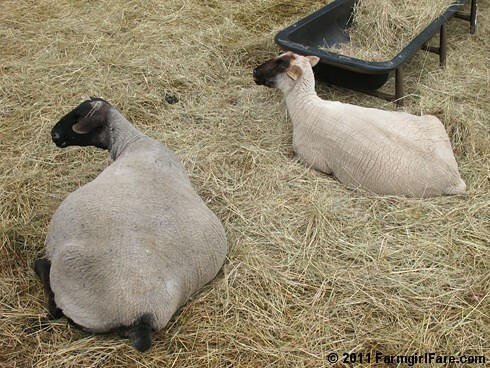 Martha, who was sometimes known as the World's Best Pillow, had about the best life a sheep could ask for, though I'm sure she would have liked a few thousand more pounds of grain. 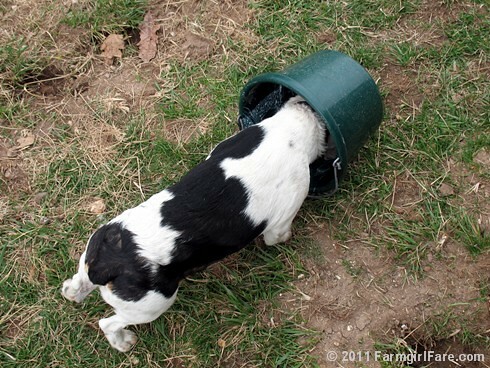 A couple of months ago Joe started referring to her as Every Sheep because she demanded a treat whenever any other sheep was being fed—and she could hear the rustle of a grain bucket from half a mile away. She was the loudest sheep I've ever known—which is saying something—and she was never one to keep her opinions to herself. Basically she never shut up. But in a good way. Mostly. 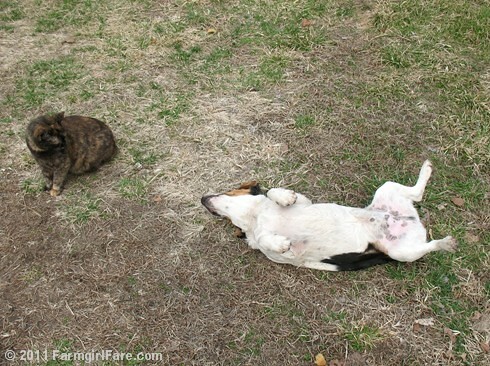 Saturday Dose of Cute: Are Weekends for Resting or Playing? Depends on if there's a puppy in the picture. 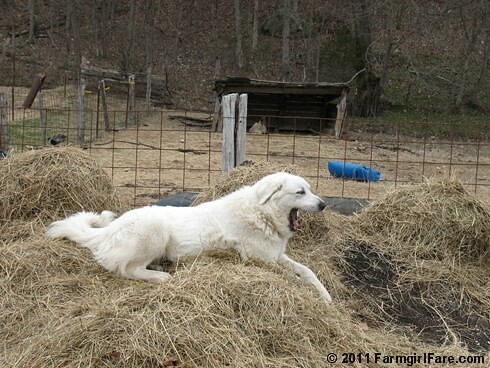 © FarmgirlFare.com, ready for a nap and raring to go. Cool weather comfort, healthy & filling, garnished with a sprinkle of spring chives. Thunder is rumbling overhead, raindrops are tapping on The Shack's old tin roof (something I never get tired of listening to), and today's forecast is calling for highs in the 30s, with freezing drizzle and snow flurries on the way. I love this kind of weather. 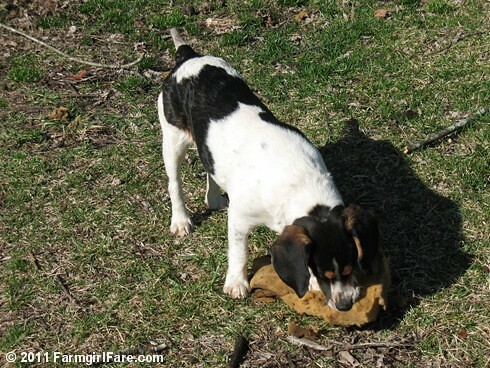 It makes me want to spend the day curled up next to the woodstove with a vintage quilt and a good book, a beagle pup snoozing quietly nearby (he does stop chewing on things once in a while), and something warm and comforting simmering on the stove. Spring may have sprung, with 80 degree days last week, but cozy quilt and soup season are thankfully still hanging on. 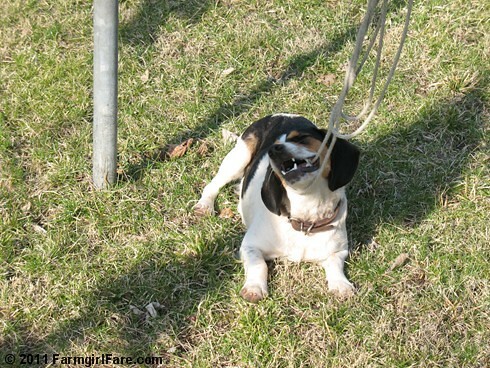 And while farm life doesn't quite lend itself to spending the day on the couch, and the beagle pup laying nearby just loudly crunched on a plastic clothespin (where does he find these things? 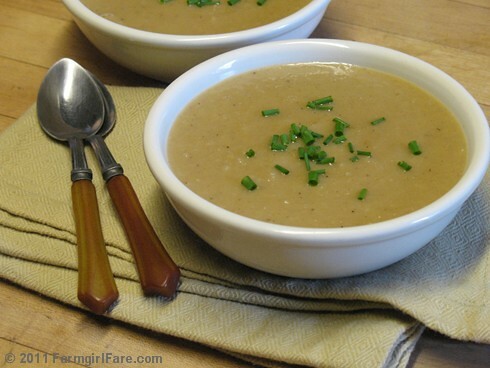 ), making homemade soup is something we can handle. The treats are gone. . .
Part three was supposed to immediately follow, but then puppy madness struck, and I forgot all about it. Since we're gearing up for Lambing Season 2011 to start in a day or two, I figured it's now or never for this cute look back. This is the second half of the lamb photos; you'll find the first half here. And there are links to photos from all of our lambing seasons—plus The Daily Donkey!—at the end of this post. Enjoy! Are you on Facebook? I recently started announcing each new Farmgirl Fare and In My Kitchen Garden post on the Farmgirl Fare Facebook page, so now it's even easier to keep up with what's happening on the farm. You can also subscribe to the Farmgirl Fare RSS feed or receive each Farmgirl Fare post via e-mail (your e-mail address will never be used for anything else). And on most days, I remember to announce new posts on Twitter. New posts on In My Kitchen Garden (my organic garden blog) are announced on Twitter here. No matter how stay connected, we're happy that you do! © FarmgirlFare.com, pink-tongued and slowly but surely joining the social circle and catching up with technology. Part three was supposed to immediately follow, but then puppy madness struck, and I totally forgot about it. Since we're gearing up for Lambing Season 2011 to start next week (Joe is down readying the barn as I type this), I figure it's now or never for this cute look back. The rest of the photos (I couldn't narrow it down any further) should be up in a day or two. Enjoy! 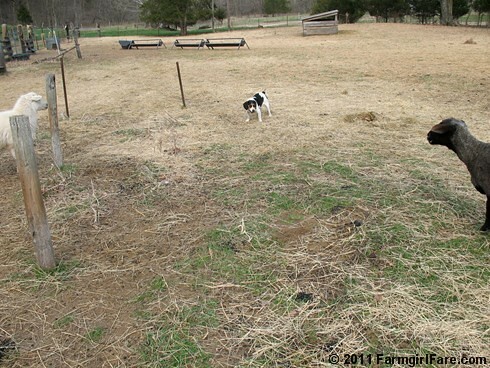 Sunday Farm Photo: Spring Has Sprung! Overwintered Swiss chard in the greenhouse sprouting back to life. Happy happy, grow grow. You can see more of what's been sprouting up for spring on my latest kitchen garden blog post. © FarmgirlFare.com, where a thunderstorm last night and 80 sunshiney degrees today created the kind of spring afternoon where if you slowed down long enough, you could almost see everything growing. I can't believe it's already the end of March! Wishing you a comfortable weekend in the company of close friends. 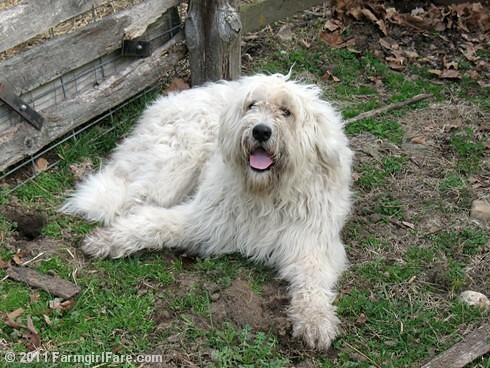 © FarmgirlFare.com, where that big beautiful ewe staring at the camera in the top photo is my (almost five year old!) baby Cary, and she's doing great. With a splash of daffodil yellow. Love looking at these cheerful flowers? They reappear year after year and are all tucked away here. 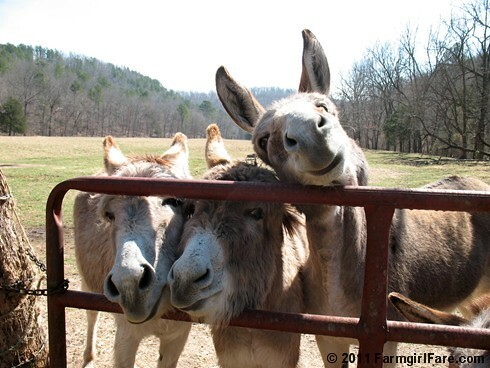 The Daily Donkey 40: Treat time in Ireland? Nope—Donkeyland! 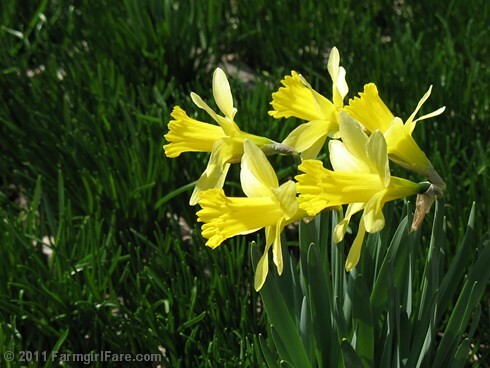 © FarmgirlFare.com, where we don't mark the arrival of spring by the calendar, but by the daffodils. And with 80 degrees today and highs in the 70s forecast for the entire next week, it both looks and feels like it's definitely here. Wednesday Dose of Cute: Donkey Boys Are Growing Up! Just meeting these little guys? You can see newborn photos of Gus here, and then get to know him better here. Newborn Gnat is here, and there are lots more photos of him here. © FarmgirlFare.com, longear loving all the way. Start eating trees. . .
Take this new found treasure. . . I hope everybody's behaving themselves this weekend—though of course it's usually more fun if you don't. Homemade chocolate chip cookies for breakfast, anyone? © FarmgirlFare.com, where we're always thinking with our stomachs. In the sheep sense—and a hay way. 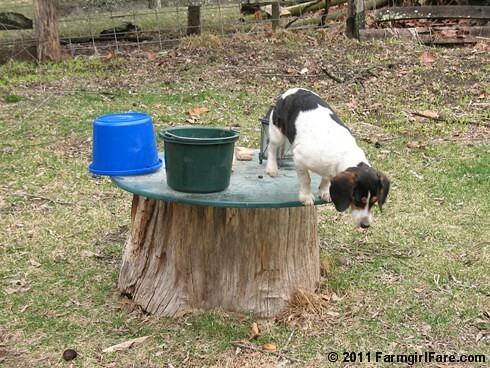 © FarmgirlFare.com, where no matter what, no matter when, there's always one. And that's what keeps us laughing. Am I the last person to fall in love with bestselling author and British domestic goddess Nigella Lawson? The woman is a hoot, and I haven't even seen her Food Network shows. Nigella Kitchen: Recipes from the Heart of the Home is Nigella's eighth cookbook but—should I even be admitting this?—my first. Her books have sold over five million copies. This one is a 3¾ pound (yes, I actually weighed it), 512-page, full-color hardcover that's packed with 190 inspiring recipes, 60 of which are 'express-style,' and makes me want to both crack up laughing and cook. All I've actually made from it so far are four batches of these wonderful chocolate chip cookies, but this book has already given me several hours of enjoyment and has spent more time in my hands during the last few months than any of my other cookbooks. Do you have any favorite Nigella cookbooks and/or recipes? I'd love to hear about them. And what about a favorite chocolate chip cookie recipe? 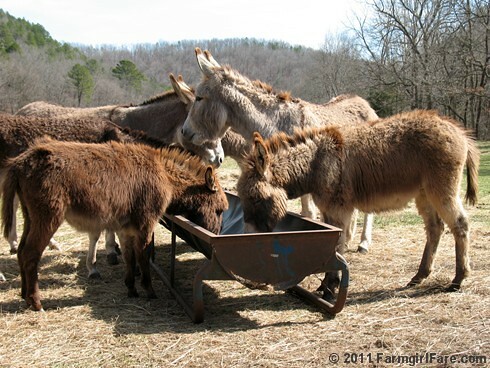 The Daily Donkey 33: Time to Treat! 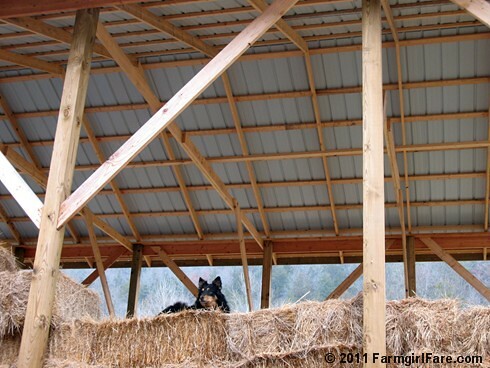 © FarmgirlFare.com, the all seeing, all crowing foodie farm blog where self-cleaning dog Lucky Buddy Bear's secret to keeping a super shiny coat (besides eating all those raw farm fresh eggs) is to rub his sides against the stacked bales of hay. It works! Scratches those hard to reach itches, too. With my little chicken eye. . .
Monday Dose of Cute: Another Day. . . Thanks for your enthusiastic response to this fun new feature. Now just cross your hooves I can keep up this posting pace. Goodness knows there's no shortage of donkey photos around here, with more being taken every day—like my new favorite above. These girls crack me up. 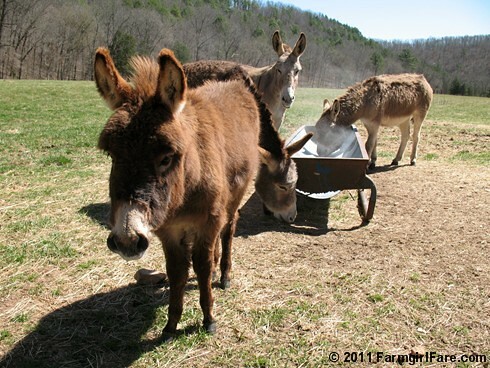 And Esmeralda, the fourth donkette, was right there, too, captured in today's Daily Donkey. © FarmgirlFare.com, aka Longear Lover's Paradise, where cute faces are impossible to resist and organic carrots are purchased by the bushel. Sunday Night Dose of Cute: Ready for Monday? Hello! 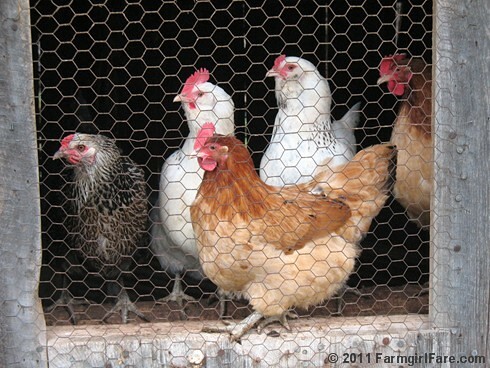 If a Disney movie preview ad about aliens popped up in the middle of the screen during your farm visit, I apologize. It's not supposed to be there. 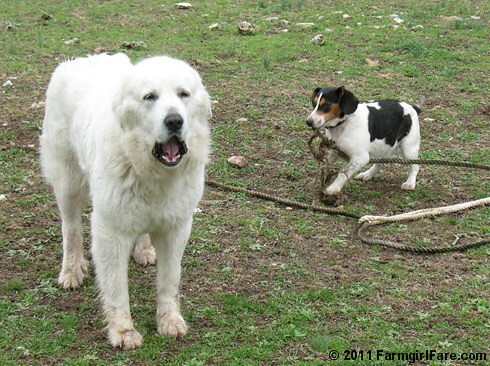 Yeah, it scared the donkeys, too—but please don't tell them I told you. © FarmgirlFare.com, the time flies way too fast foodie farm blog where those of us who are still tackling very long Winter To Do Lists aren't wishing this quickly disappearing season away (68 degrees today! 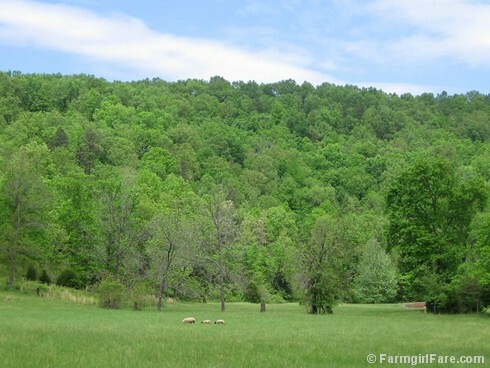 ), but the donkeys and sheep—neither of whom, as far as I know, ever make To Do Lists—are anxiously looking forward to trading homegrown hay for fresh spring grass. And speaking of things to do, I'm way behind replying to e-mail and blog comments. Thanks for your patience! 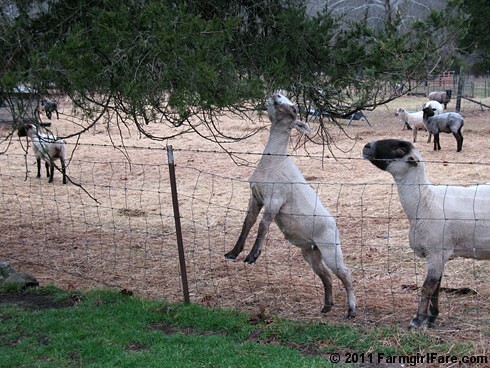 Wednesday Dose of Cute: The Sheep Are Sheared! And Bert helped. . .
Much to my surprise and delight, I've found hundreds of heart shaped rocks around the farm over the last several years. (I'm not real picky; they don't have to be perfect, just like love isn't.) You can see more of my heart rock collection here and here. 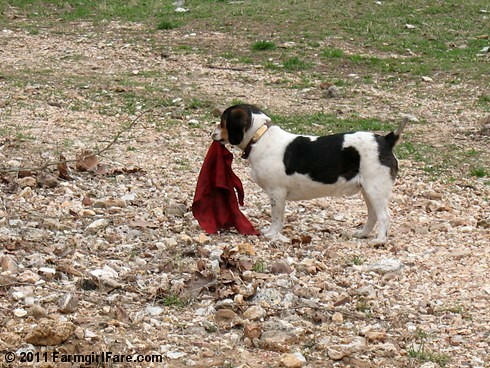 © FarmgirlFare.com, the well worn foodie farm blog where some of my favorite work shirts are so tattered and full of holes that each time I wear one, I swear this will be the last time, and then I'll wash it so the rags I cut it up into will be clean. But then somehow the freshly laundered shirt makes it off the laundry line and back into my pile of clothes—where I figure I'll just wear it one more time.